On Feb 19th the Lakewood Historical Society presented the history of a local business that has been in the area for almost 70 years. Charlie Maxwell, long-time employee and close personal friend of Harold LeMay, related many fascinating anecdotes about the man behind the Pierce County Refuse Company. Starting with only one garbage truck in 1942, LeMay built up his business to become the largest trash-removal company in Washington and the 10th largest in the country. He became even more famous for his fascination (some say obsession) with old cars than for his very successful business. His collection grew to over 3,000 vehicles, thus certifying him for the Guinness Book of World Records as having the largest privately owned automobile collection. 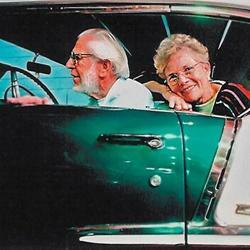 When Harold died in 2000, his wife Nancy and son Doug LeMay carried on the family business and maintained the car collection, continuing the tradition of a yearly open house in August at their home, a place Harold used to refer to as "a three-story house with a 300 car garage". In 2008, the business was sold to Waste Connections, Inc. In 2010, the LeMay family formed its own nonprofit corporation, the LeMay Family Collection Foundation, and opened for public tours six days a week on the former site of the Marymount Military Academy in Spanaway. This was the site of the Society's fundraiser last year that celebrated the Centennial of the Tacoma Speedway. In June 2012, a new car museum, America's Car Museum, opened in downtown Tacoma, next to the Tacoma Dome. The two museums complement each other and tell the wonderful story of America's love affair with the automobile.